I've been dying to do this review, I can't hold back any longer! 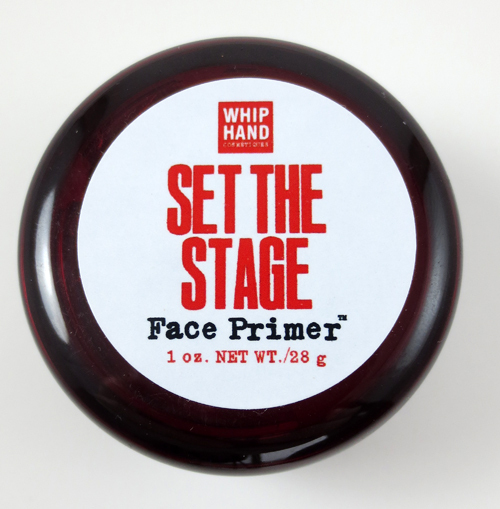 Set the Stage primer has to be arguably the most popular, most talked about product from the Whip Hand Cosmetics line up. It's been raved about by makeup artists and bloggers alike. I was endlessly jealous because my skin absolutely revolts around primers. I figured I would forever be in the dark on this miracle product. For years I've tried various primers, Bare Mineral Prime Time, E.L.F, Monistat Chafing Gel, the list goes on. I was stuck in a vicious circle, the only ones that came close to working also caused immediate cystic acne. It sucked. The Whip Hand team knew I had a miserable track record with primers. And they were kind enough to provide me with a jar to try and see if my picky icky skin could take it. Here are the ingredients in Set the Stage Primer. I won't pretend to know what they all are, but it was the dimethicone that scared me most. In my mind "cone"= Danger..WARNING! However the Whip Hand team explained since silicone is so inert, there was a good chance it wasn't the "cones" causing the reaction. There are other ingredients including SPF agents that are more notorious for being irritants, which were purposely omitted from this formula. I had hope those were the culprits and maybe this might work for me. Set the Stage is a thick velvety gel that dries down to a micro powder finish. And like all other Whip Hand products a little goes a long...long....long way. 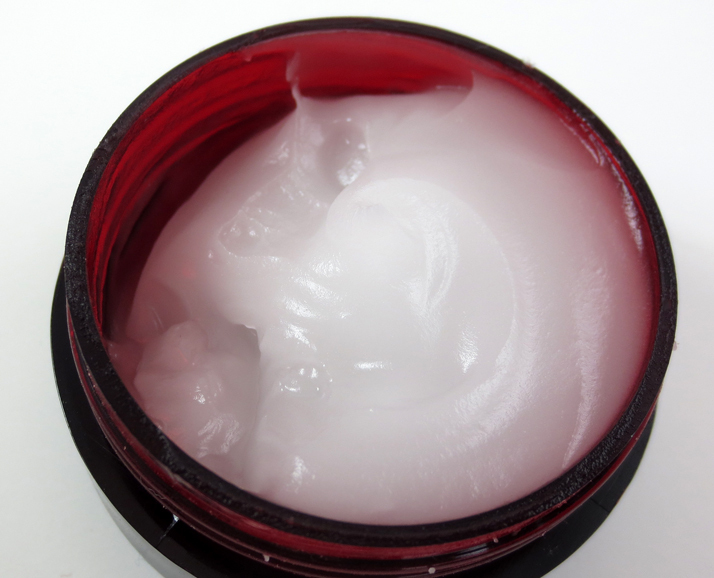 Only the tiniest dab will cover your entire face and leave you with a satin, smooth finish. It feels amazing on the skin. It has a delicate velvet feel and is totally weightless. 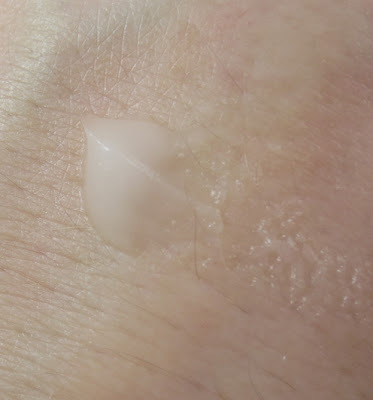 I put this on my hand to swatch and after using it for the last week, I can tell you the amount above is easily enough to cover your face several times. Seriously, you need so very little. I've used this for over a week and have only made the tiniest dent in the product that was inside the lid. I don't think I will need to touch the main bulk of the product for several weeks. I can see one jar lasting well over a year, and really if you are using this for private consumption, maybe longer. Here you can see the primer smoothed out over my hand. The lines and texture on my hand are noticeably diminished. It does everything you want a primer to do and does it beautifully, however, this little work horse isn't done yet. 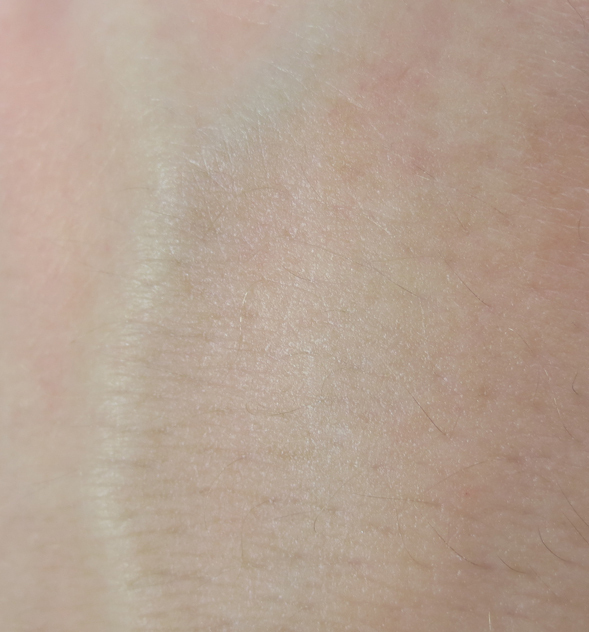 To illustrate a point, and I wish dearly I had some good photos to show, I will describe what a normal foundation experience is for me, even with "other" primers. I have a very oily T-Zone and flakiness on my cheeks and forehead. I am truly combo. It doesn't matter if I use liquid or powder foundation, even with setting powder my foundation starts to dissolve in a few hours. Then I am on damage control, blotting my brains out until I can get home to scrub it off. And that was pretty much my life, as far as foundation was concerned. Here is what happens with Set the Stage, and honestly, it's a damn beauty miracle. I moisturize and put this on under my foundation. I then apply either a Meow Cosmetics Powder Foundation or MUFE HD Liquid Foundation. Everything applies better, looks smooth with a satin/dewy finish. With other primers, especially oil control primers, my face could look flat, almost chalky. Set the Stage left it looking natural and youthful. It wasn't shiny or oily, it was was a true satin/dewy finish. I set it with Tarte Smooth Operator Powder. So far, looking really good. Blusher on and I am out the door. I work 10 hour days in a fairly humid environment. The first day I used Set the Stage I didn't blot....not once. I checked every few hours and I never looked oily, shiny, greasy, my foundation didn't slide, crease, separate, crack wise..nothing. I had very minimal oil breakthrough, but it never looked oily, it still looked fresh. I probably could have blotted, but I just didn't feel it was necessary. It also did not dry out my flaky parts. My face felt moisturized and fresh all day. I came home, 12 hours later and my foundation looked exactly the same. I noticed that even my blush looked the same as it did when I left 12 hours earlier. I can't think of a time where any blush I've used lasted 12 hours intact. Now, I can't swear that the following is because of the primer, but since using this, my skin looks better. It is clearer, smoother, it looks noticeably improved. I suspect this is partially because this primer does a wonderful job of locking in moisture and protecting my skin from the chemicals and environmental irritants. Again, this is a theory based on zero scientific proof, just visual evidence. You need it! This product lives up to the hype. I've never used a primer that even comes close to the quality, wearablity and functionality of this product. 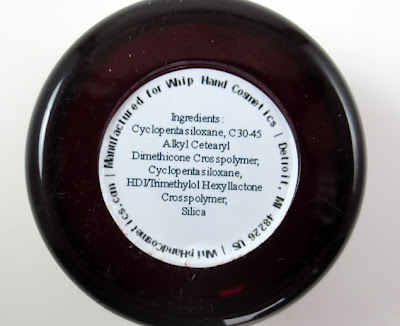 Whip Hand Cosmetics takes products you think you know, puts their own twist on it, turning it into a unique must. Set the Stage Primer is the very best example of this. Even though this was a sample provided to me buy the company, I turned right around a purchased it myself for a future giveaway. It is the definition of Holy Grail. If you are in the US, you never pay shipping and there is no minimum order. I've been using Smashbox Photo Finish primer and this looks almost the same and sounds like it dries down to the same. I've only been using samples so, I'm in the market for a full size. Going to have to do a price comparison for sure! I agree that it's better than anyone else's. I still test primers but this is THE one I like best. Time for me to review too! Thanks Marcia! We would LOVE for someone to do a head-to-head between Whip Hand Cosmetics Set The Stage Primer, Smashbox Photo Finish, Makeup Forever HD Microperfecting Primer, and Laura Geller Spackle. You can also throw in Too Faced Primed & Poreless and UD Pore Potion. What other ones should be included on the list? I've not used Smashbox so I can't make a direct comparison, but if you are in the market, give it a shot. They have a 30 day return policy, so you can try it worry free. Marcia, I am consistently impressed by their products. Did you try the creme shadow Thermal? Talk about a game changer. I want to try Whip Hand, and contacted them about reviewing some products on my blog. I was really excited when they said they'd get back to me the next week, since they were opening up a new store. They didn't, and I contacted them again, but no response. After hearing all of the good things you've written about their products, I really want to try some of them, but it just makes me a little wary of what their customer service might be like. I am sorry you've had a hard time reaching them. I can only speak from my own experience with their customer service which has always been excellent. I know every company can have those few times when customers fall through the cracks, for one reason or another. I've been in that position with other companies with normally outstanding service. I would try again. I have been impressed so far with their service so I really think this was an unfortunate hiccup. Our apologies for the communication issues. We're looking into what happened here. One of the challenges we're attempting to solve for is that as we've grown, the volume of sample requests from bloggers has also grown tremendously. On average, we are receiving 20-30 a week. When we were receiving 2-3 a week, it was more manageable. However, since last fall the volume has become a bit of an issue, and that's likely why this fell through the cracks. We are working on launching a more formal process for gathering, evaluating and fulfilling blogger sample requests this month. Part of that process will be a program that bloggers can apply for online to have their sites considered for inclusion in the program. Those that qualify will receive a blogger discount on products, as well as have early access to new products and samples. It will be a bit like our @Pro program, but for bloggers. The discount will be less than the @Pro discount, but still pretty significant. This process should streamline things and ensure that requests are getting routed to the right people for evaluation, as well as follow-up and fulfillment. We love bloggers. Indeed the support and coverage they have provided to Whip Hand thus far has been instrumental in building awareness for our brand. However, we've also had to become much more selective about who we send product to since the volume increase. It's become so easy for someone to throw up a Blogspot or Wordpress site these days with minimal effort, post some reviews and then start contacting companies for free samples (and we're not saying you fall into that group, Marilyn.) If we sent out freebies to every blogger that contacted us, we'd quickly be out of business. So we try to really conduct some due-diligence on bloggers prior to shipping samples. That takes time -- especially since traffic alone is not our sole criteria. We'll go to the blogger's site and spend at least 20-30 minutes reading articles. We then go and check out all of their social media properties. We'll also check Klout scores and traffic numbers. All in the process can take up to an hour per blog. So when you are receiving 30 requests a week, that's almost a full-time job just reviewing the sites. And then there is the follow-up, shipping and re-follow up with the bloggers. We spend that amount of time on the due-diligence portion because simply looking at one item (say traffic) isn't fair to bloggers with lower visitor numbers, but highly-engaged communities. For example, we will send samples to lower-traffic sites if the blogger is particularly skilled at reviewing products and also has a community interacting with those reviews (whether in comments, Likes, etc.) For us, comments sometimes weigh more heavily than traffic, because it shows influence and interaction. Crystal is one of those bloggers, for example. She spends a lot of time testing, swatching and writing the review and is technically very thorough. And she has a well-engaged readership. In Crystal's case, she's actually purchased the majority of the product she reviewed from Whip Hand. The exceptions were a recent Beauty Army sample set we sent her and the primer, which we offered to her to try for free because she had issues in the past with primers and ingredient sensitivities. While there is no excuse for not communicating back, we did want to provide some background around what we use to evaluate requests and some color around the current volume of blogger requests and the processes we're putting in place to make this more efficient and enjoyable for everyone. It's an area that we know we need to get a better handle on and are doing some specific things in 2013 to avoid what happened with your request. So again, we will go back through, Marilyn, and find your original request. Please allow 24 hours for us to do that and then we'll be back in touch with you. Thanks for your patience and understanding. While I understand the need for screening bloggers before providing samples, a Whip Hand representative specifically said that they would be mailing samples the following week, and had requested my address. It's not that I expect free samples because I'm a blogger and I sent you an email. I understand that the volume of blogger requests means that not every blogger will get a response. I dug into this issue more last night and personally reviewed all of the email exchanges between you and Whip Hand. You are absolutely correct. We said we would send you box of samples, and for whatever reason, it did not go out. Not just once, but twice. That is not acceptable. Period. We've addressed the issue internally and your products shipped to you today. We appreciate you bringing this to our attention so we could fix it and improve the process. Thanks for your patience. I can assure you this will not be an issue in the future. Hi! Great review, I have to say. This sounds like a great primer, and I really do need a primer in my life, but at the moment it's a bit too much $ for me to spend on a full size product+shipping+customs fee. Do they sell sample jars? I couldn't find it on their site, but someone was mentioning samples in the product reviews section. I see that your familiar with the company based on your many reviews of their products, so I figured I'd just ask you. Thank you! Tea, I will see what I can find out about samples. I am not sure if sample jars are in the works or not. I will ask and get you an answer. We do have some sample sizes (although the quantity is limited right now.) They are about 25% of the quantity of the full-size jars. We are likely going to make them available for sale online. They will retail for US $10 and should last a person about a month of daily use. We will let everyone know when they are available. That said, if you are in the US or Canada, do offer free shipping (no minimum order) and a liberal return policy. We try to take as much risk out of purchasing the full-size product as we can. To date, we have never had a customer return the primer because it didn't perform up to their expectations. Ooh might have to track this down and try it. Love a good primer!! I have been looking for a good primer. My skin is like yours. The oil is annoying, but the dry flaky parts on my cheeks, forehead and chin are the worst. I have yet to find a primer that will keep the foundation from settling in the dry spots and making me look like a dry old 100-year-old. You didn't mention in your review how the flaky parts of your skin looked under foundation when using the this product. If it helped - I'm buying this ASAP. You are correct, I was not clear about the flaky parts and I will revise the post in the AM to reflect that. I had no issues at all. I clean (Cetaphil), exfoliate and moisturize at night. I clean again and moisturize in the AM. Then I apply the primer. When I do, it seems to seal in that moisture, so my skin doesn't dry and get flaky around the mouth and cheeks like I was used to. It helps keep my skin very balanced. Most primers I've tried can do one or the other and usually not very well. In my opinion this primer does both beautifully. It is still important to make sure you are exfoliating and moisturizing and the primer will preserve all that hard work.